Here we go with the CrossFit again. It’s only February and I feel like a broken record, saying, “If you know me and Nick, you know we love CrossFit” but honestly, I hope 2012 brings many, many more CrossFit inspired “I’ve Never Done That” posts. Why? Because honing your physical skills and doing these movements that bring you out of your comfort zone (sometimes WAY out of your comfort zone) not only make you a stronger person physically and mentally; they are building blocks for not just competence, but excellence. When Nick and I first started CrossFit, I have to say I was a lot more fit than I am now. I was working out for about an hour a day, running a few times a week, and doing weight training and plyometric exercises. When I started CrossFitting, I stopped working out for that hour a day (CrossFit WODs range anywhere from 5 minutes to half an hour, not often more than that), and just ran recreationally. And I got fitter. And stronger. I was in awesome shape, and learning new things. It was so much fun. But then “life intervened”. Running a business in a bottomed-out economy, losing a key staff member, and a shift in our business model meant way longer hours at work and tons more stress. I personally do not advocate blaming “life” on one’s lack of discipline or self-worth/motivation – but what I was experiencing was a chronically overwhelming situation that was just completely new and different to me – and I didn’t cope well. I started slacking off on my workouts and on my eating habits – generally just hanging out on the edge of giving up. That was two years ago, and though I still did WODs (Nick and I even did the hero WOD “Murph” together at the end of the year), I hadn’t been doing them as often as I should have, and I’ve slowly gotten out of shape since then. This year, taking on the massive project Nick created last year of INDT, I wanted to try to use it as a tool to not only change my life by “simple” virtue of doing something new every day, but to also make goals that I’ve always had, big and small, a priority. Organizing my linen closet and experimenting with new foods will hopefully lead to a clean house and an expanded culinary repertoire. Modified rope climbs and clapping pushups will hopefully lead to full rope climbs and, well, handstand pushups. 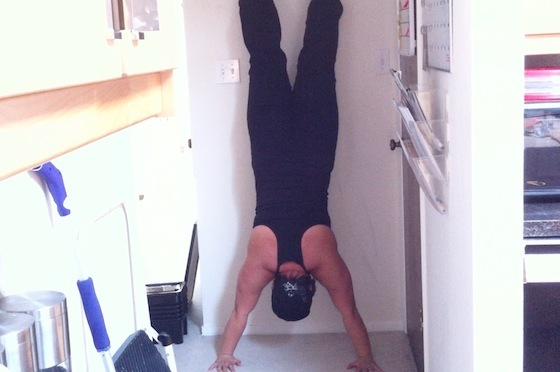 The CrossFit standard of handstand pushups are with your back against the wall. The athlete kicks up to a handstand position with their heels against the wall, lowers themselves down until the top of their head touches the ground, then pushes back up again. Of course, when we went to the CrossFit Games last year, they also added a deficit to make it even harder. But hey, I’m working my way up here. When we started doing CrossFit, I had the shoulder strength to hold myself in a handstand against the wall, but not enough to do a full handstand pushup, so I’d just put several pads on the ground under my head and do modified ones with a very limited range of motion. But I realized it wasn’t going to help me progress to a real handstand pushup if I didn’t work through the pivotal point my shoulders needed to pass through so I could get my head to actually touch the ground and then be able to press myself back up. I ended up doing pike pushups with my feet on a box for my handstand pushups and wondered if I’d ever be able to do a real one. Although like I said I’ve been getting out of shape, my strength is still pretty much there – Nick and I have stocky frames – good for building muscle, but also just fantastic for fat accumulation. Since I’m heavier nowadays, it makes bodyweight exercises more difficult, so I’ve been working on my shoulder strength this year. My legs are pretty strong, but just like all women, my upper body is just not predisposed to muscle mass. I’ve got to work at it. Anyway, this morning I thought I’d just try. Like I said, the CrossFit standard handstand pushup is with your back to the wall, but coach and gymnastics genius Carl Paoli teaches that this isn’t the best method, as it breaks the athlete of the “hollow body” position. In the hollow position, you have the most strength throughout your core, and you can push and pull with much greater force with that midline stabilization and correct form. Carl recommends practicing handstand pushups with your chest facing the wall instead, so that you can work on maintaining that all-important hollow body. I’m really glad I was able to do these. I’m actually at my heaviest ever right now and that’s extremely discouraging for me. I don’t pay complete attention to the scale, but I know I’m bigger, and that number doesn’t make me happy. I need to work on my form, like putting my head a bit further in front of my hands to form a more solid triangular base, but knowing I can actually do a handstand pushup right now just gives me more motivation to keep working. How much better will I be at these when I’ve dropped some fat? While handstand pushups against a wall are a crazy feat in and of themselves for a lot of people, they’re simply another progression for Coach Carl Paoli – on the way to that unassisted handstand pushup. One day, Carl. One day.